The fifth DI Tom Thorne novel, set in the heart of London. To his friends, his foes and even to himself it looks as though Tom Thorne's career is on the skids. On his last case he had seriously over-stepped the mark, and now gardening leave has been suggested and all he has to tend is a window box. So when it appears someone is targeting London's homeless community it seems pefectly natural for Thorne to take a step nearer to the gutter and go undercover amongst them. He blends into the sometimes invisble community easily - too easily perhaps - but the information he gleans quickly proves that this is no random killer, it is someone with a very distinct purpose and a very specific list of victims, only the team supporting Thorne from the outside don't have the key to motive or identity. 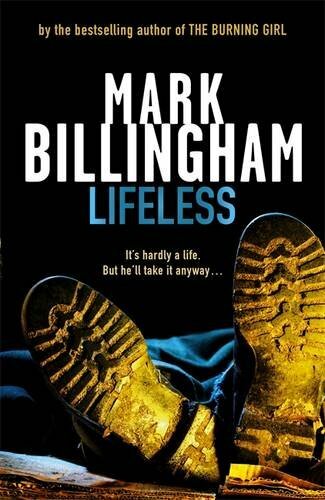 Then somehow the fact that a policeman is working under cover becomes public knowledge ...With acute observation of character and place, combined with his acknowledged mastery of plotting, LIFELESS raises the Thorne series to an even higher level.